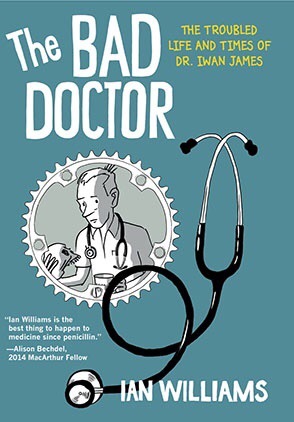 “The Bad Doctor” by Ian Williams is a tale of the entwined experience of a doctor and his patients. Unlike most medical narratives that tend to reinforce the hierarchical position of doctors as the arbiters of knowledge and patients (particularly those with disabilities) as receivers of knowledge, “The Bad Doctor” complicates narratives of disability and medical authority. Williams’ exploration situates Dr. Iwan James as someone who learns from his patients, changing with each medical encounter. He is a figure who combines narratives of disability with narratives of medical experience. Dr. Iwan James is portrayed as a doctor who has experienced Obsessive Compulsive Disorder (OCD) his entire life, generally fixating on ideas of the occult as a threat and prayer as a method of averting disasters. Interweaving with narratives of encounters with patients, including one patient with OCD who helps Dr. James re-assess his own compulsive thoughts, Ian Williams also portrays elements from Dr. James’ childhood. Drawn with beautiful trees coming from his head that hold bubbles about all of the things that the young Iwan wants to protect, these pages about his obsessive thoughts illustrate the complexity of OCD. Young Iwan spends most nights going through a series of blessings of each family member, having to repeat these blessings if anyone or anything is missed. Even stuffed animals need a specific number of pats each night to ensure that they are protected. Williams draws circles of light around each of the things that young Iwan wants to protect, linking them together in a complex pattern of thought, and yet these images are also surrounded by caution signs depicting possible outcomes if he misses anyone. As Iwan grows up, he begins to obsess over the occult, believing that his dog died because he listened to occult music. After his wife becomes pregnant, Iwan sees occult imagery everywhere around him and seeks to try to protect his children from their influence. Dr. Iwan James develops coping mechanisms for his OCD, able to develop methods to control these obsessive thoughts, but they don’t disappear from the narrative. This is not a narrative of disability where there is an easy solution through a “cure”. Rather, Dr. James’ continued work on himself allows him to be a better doctor, to engage with patients from a place of knowledge, but not of arrogance. Instead, he is able to share his narrative with patients to help them to better understand themselves and their own compulsions. Dr. James still has persistent thoughts and continues to have suicidal ideation from time to time and these suicidal thoughts enter into the comic page in imagined scenes of shooting himself in the head or guillotining off his own head. Ian Williams illustrates the way that these thoughts can interrupt everyday narratives by inserting them between panels, at random, evoking the power of suicidal thoughts to seep into the mind during every day encounters. Told through powerful snippets of encounters with patients and intense flashbacks of obsessive compulsive thoughts, “The Bad Doctor” creates a complex view of medicine and the relationship between an individual and the medical system.